Decorate your home for the holidays with wonderful Native-themed ornaments hand-crafted by American Indian artists from the Heard Museum Shops during this annual event! Choose from hundreds of ornaments in a variety of art forms for yourself or for unique holiday gifts. Prices vary. Admission to the Heard Museum Shops is always free – and we never charge sales tax! Bring out-of-town friends and family to learn more about Native cultures while you shop. Get a jump-start on holiday shopping while avoiding the chaos of the mall. More than 20 talented Native artists have crafted ornaments featuring carved wood, miniature baskets, pottery and beads just for this event. Decorated wreaths, books and gifts made by Native artists will also be available for purchase. Most ornaments are priced between $10 and $40. Every year the Heard Shop commissions one of our artists to create a limited-edition of 20 ornaments in an exclusive design as our signature ornament. 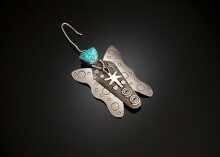 Each sterling silver ornament is signed and numbered by the artist and priced at $175 and are available in-store only. 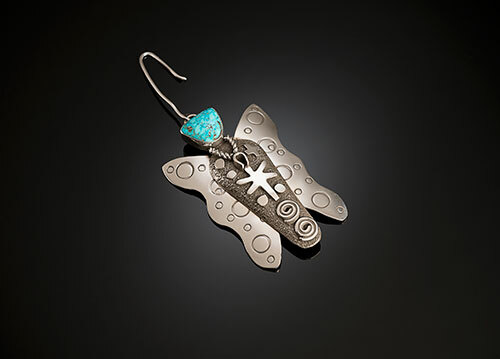 This year’s signature ornament (pictured in the sidebar) is by Navajo silversmith Alex Sanchez. Sanchez’s work reflects his Southwestern heritage, crafting beautiful contemporary and traditional-style jewelry with petroglyph designs. His work often incorporates the horseshoe shape, which has become his hallmark. The weekend’s offerings will also feature hand made nativities from the Huichol Indians and Mata Ortiz as well as the Pueblo and Navajo tribes. Make a day of it! Enjoy the museum and dining at the Courtyard Café.